This is a recipe for the summer that people would taste on a balcony at the beach, maybe with some good wine. I created this recipe thinking of something delicate and fresh with specific tinges. 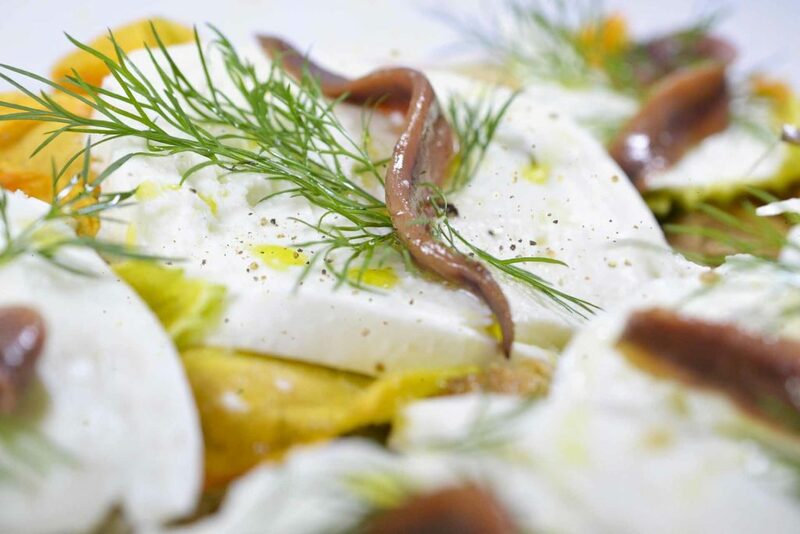 In order to obtain such sensations, I decided to use courgette flower, just cut off buffalo mozzarella and Cantabrian anchovies unique taste. The flavour and the tinge left after the mastication are due to the dill and the Bengal long pepper, which are initially sweet until their taste becomes more intense. This recipe is not for everybody. It is possible to make this recipe only if all the high-quality ingredients mentioned above are available. If not, forget it! The preparation of this recipe is simple as the ingredients are bought already made. On the contrary, artisans do most of the job by providing buffalo mozzarella and cattle ricotta therefore the choice of the dairyman is very important. After buying the dairy products, prepare them as follows: dilute the ricotta with some water and a pinch of salt to obtain a dense as well as easy to spread cream; and, slice hand cut buffalo mozzarella. Clean courgette flowers from the stem, stiffer and harder parts; open and wash them quickly; and, let them to dry on paper. After being cooked, our pizza has to have a good consistency. In other words, it has to be crispy, stretched and not dry at the same time. Here’s why, after rolling out the pizza dough, you need to spread relatively big spots of early made ricotta cream and put it in the oven. Bake it in a medium temperature, let the base become crispy and take it out of the oven. At this point, the ricotta would be thickened and adhesive for the courgette flower. © 2015 All Rights Reserved by Marco Montuori.